Rebel Junk (formerly Junk Salvation) is brought to you by Dixie DeRocher of the Funky Junk Sisters! 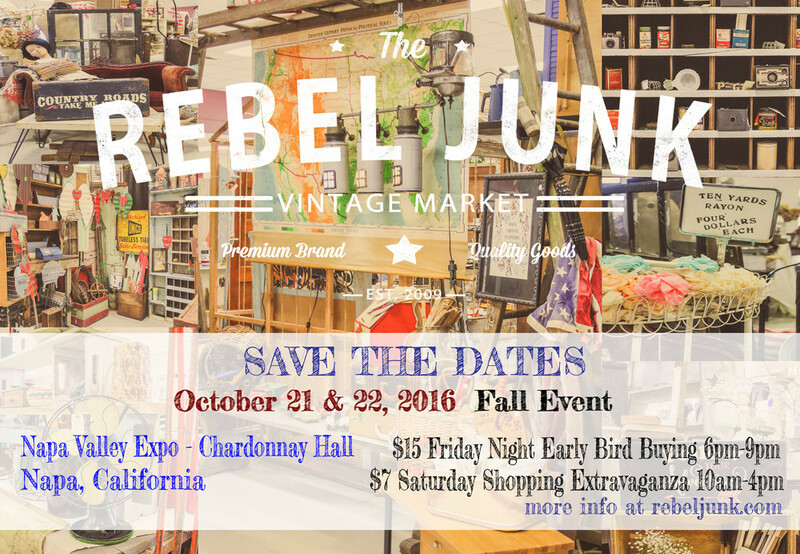 We are SO excited to bring a fabulous and fun filled VINTAGE MARKET to NAPA, CALIFORNIA! That's right! We are going to CALIFORNIA!!! This is a Friday Night and Saturday shopping extravaganza! We promise you can find some of the most unique vintage items under the California sun! SAVE THE DATES! October 21 & 22th, 2016. Friday Night. October 10th from 6pm-9pm is EARLY BIRD SHOPPING! Tickets are $15 online! Available online until October 10th or until SOLD OUT! Online tickets get you EARLY BIRDS in at 5:30pm instead of 6pm and admission for Saturday too! Just another reason to buy online! Tickets will be mailed to you. Saturday, October 29, 2016, the shopping extravaganza starts at 10am and goes until 4pm for the general public. Admission is $7 at the door on Saturday!